Gardening in a woods in eastern Iowa; a visual narrative. There are certain plants I'm just crazy about, but I can't quite explain why. Our native wildflower blue cohosh (Caulophyllum thalictroides) is one of them; it is subtle to the point of being invisible in the deep woods where it likes to grow... it is uncommon, but not yet threatened, yet I doubt one person in a hundred can say they've seen it. It almost always grows on cool, north-facing wooded slopes, and its foliage is as cool as its surroundings; lovely blue-green, heavy and waxy foliage in layered mounds. The flowers as seen above are inconspicuous, but they are replaced by blue berries. I've thought about picking one or two berries and planting them in the garden, but this is one of those plants that just belongs in the shady, quiet forest. 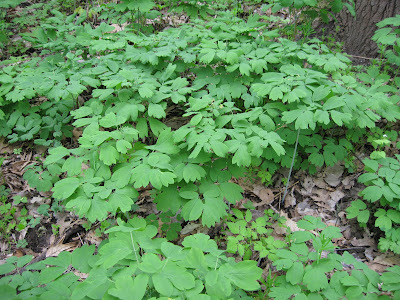 Unfortunately, the colony of blue cohosh pictured above is in danger; a large patch of garlic mustard has surrounded it... I spent several hours pulling all the hundreds of second year mustard plants getting ready to seed, then will be going back next week with my propane torch to start scouring tens of thousands of first year garlic mustard seedlings; it will be a five year project... and people wonder why our garden has weeds. It's pretty ... pretty green covering the ground. Olivia... GM is the WORST! Kim... yah, you're probably right; I'm just being optomistic. it des depend, though, on whether you disturb the ground or not... that just stirs up more seeds. In this case, UI'm just going to pull, spray, and burn. I picked up a blue cohosh at our neative plant sale last year and planted it under our pine tree (north facing slope if you believe it and it has become one of our favorite plants. 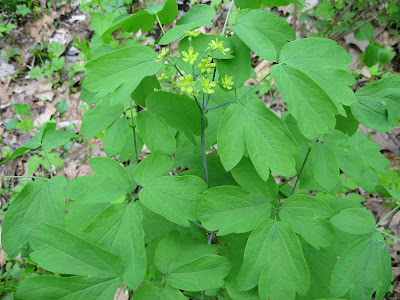 It has pretty yellow flowers and is a great addition to our native woodland garden. Thanks for talking about this plant! I have photos of ours on my blog, but they're not as big as yours ... yet! Rosemarie... isn't it just a neat plant? I just love the foliage. It's just a puzzle why it's not better known, but it's for woodland gardens, not borders, and the flowers are only for those who like the subtle. I have been walking in the woods for more years than I care to admit and I do not know this plant, I will be watching for it on my next walk. A propane torch . . . why didn't I think of that? After all the time I spent pulling out garlic mustard last year, I find it just as plentiful in those places this year, and popping up in new places besides!!! At least it's easier to pull than dock, and doesn't burn your skin like wild parsnip. GM is unfortunately everywhere now. Kathy... the torch is really almost mandatory if you have large patches of first year seedlings. I like this plant too. It looks so pretty as it emerges from the leaf litter. The berries are an amazing blue! I tried to take a picture of mine last year, but the birds beat me to them! I am a fellow garlic mustard warrior. Please tell me more about the torches. What size, brand, where to buy, what area one tank will cover...? Thank you. I am a fellow garlic mustard warrior. Please provide more info on the torches -- what brand, size, what area will one tank cover...etc.? Thank you. min... Google propane torch, and you'll find all kinds of info. I specifically have a backpack gas canister (10 lb, which I think is a real plus. May the Force be with you (Just got back from pulling GM in the woods).